It is starting to get to crunch time for the St. John’s University Men’s Basketball team, with their second opportunity to show the BIG EAST Conference what they can do, every game is going to be a big one for the Red Storm. Playing against DePaul with not only a national crowd, but a packed Carnesecca Arena (5,040 to be exact) all watching got to see a more aggressive, attacking Red Storm team that led them to the 86-78 victory over DePaul (12-14, 6-7) in BIG EAST Conference play. With not only a healthy but a fired-up D’Angelo Harrison leading the way with a season-high 33 points, the rest of the team followed the lead of the Seniors as everyone played with extra grit in the game. Harrison also grabbed 10 rebounds for his second-straight double-double third of the season and sixth of his career. St. John’s has had four players scored in double-figures for the eighth time in the last nine games. In the contest against DePaul, Phil Greene IV finished with 18 points, while Sir’Dominic Pointer and Rysheed Jordan both had 15 points each. Gaining more playing time and impressing many has been the play of Felix Balamou and Amar Alibegovic who are both starting to gain positive momentum at the right time for the Red Storm. 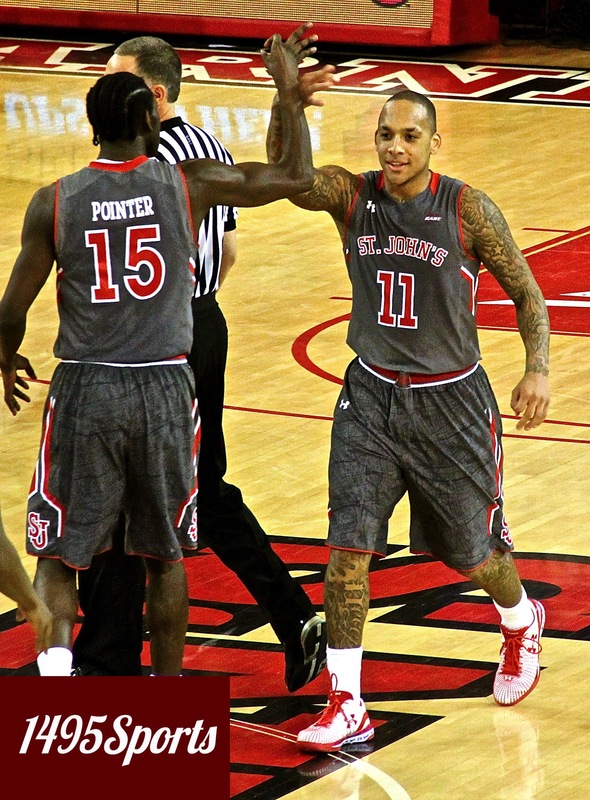 With the victory St. John’s now improves to an 8-1 record at Carnesecca Arena this season. St. John’s outrebounded DePaul by a +16 margin (43-27), the largest rebound margin since Nov. 17 vs. Franklin Pierce (+23). The Red Storm (16-8, 5-6 BIG EAST) will now be on the road for games against Xavier and Georgetown before returning home to host Seton Hall on February 21 at Carnesecca Arena, with tip-off scheduled for Noon.